So far, so very good for the Hillsboro Spartans softball team. 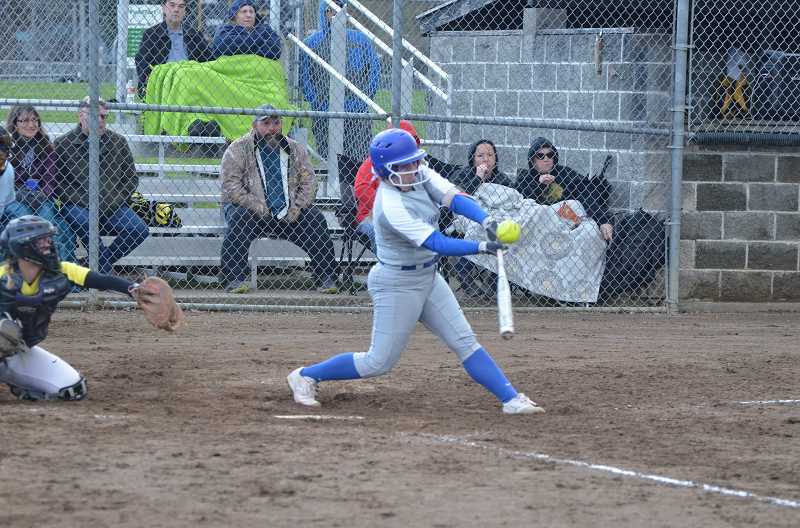 The Spartans began their bid for a repeat Class 5A Northwest Oregon Conference title with a wire-to-wire win at St. Helens on a chilly, slightly damp Tuesday, April 9. Hillsboro has been near perfect, at least in the win column, this season. 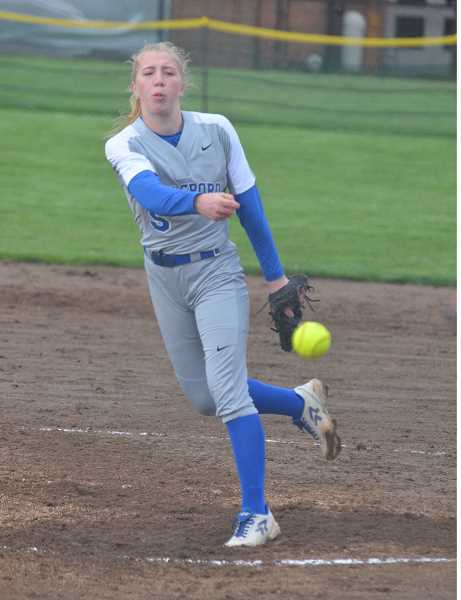 But the Spartans were coming off their only loss after an 8-0 start, having fallen 8-6 to 6A Newberg on March 26. To say Hilhi was eager to get back on the diamond and make amends for that — and for a 9-5 loss at St. Helens late last season — might be an understatement. "We came out ready to play," said junior pitcher McKenzie Staub said. "We were excited to play, to start league. We had a really good preseason, so we want to keep that going." The Spartans are ranked No. 1 in the state by 5A coaches and were No. 2 in the Oregon School Activities Association computer rankings going into the St. Helens game. It didn't take the Spartans long to start showing why. They took advantage of some early mental and physical errors by St. Helens (which dropped to 2-6 overall), scoring two runs in the first inning and four in the second for a 6-0 lead the Lions never could overcome, and en route to what would ultimately be a 13-3 road win. Lions coach Miranda Little lamented her team's inability to cover home plate on a wild pitch that allowed two runs to score, as well as other tardy plays in the field. "I think the girls were a little super excited with our first league game," Little said, "and it was a home game, and it was against Hillsboro, who we beat here last year, so there was just a whole lot of amped-up energy and we made a few mental mistakes that cost us a few runs early." The Lions also had trouble with Staub, who struck out 15 batters. St. Helens got six hits but wasn't able to get the extra bases needed to score more than twice. An third-inning RBI double by senior shortstop Taylor Dow, last year's NWOC Player of the Year, was the Lions' biggest blow. Sophomores Jasmyne Pence and Kamryn Hubbs each went 2 for 3 for St. Helens, but on Hubbs' first time at bat, Staub "got me with the rise ball so bad," Hubbs said. "She's an excellent pitcher," Little said. "She's got a great rise ball, and she was keeping our girls off-balance. We weren't able to lay off the high ones as much as we should have. "But we finally found the ball, and we play them three times this year, so I'm hoping next time we won't swing at those high ones again and we'll find that sweet spot." Staub also had three hits, including a triple and a double, with three RBIs and three runs scored in the leadoff spot. "She's an athlete and a half," Hillsboro coach Sara Harsin said. "She's hitting her spots, and hitting the ball hard. We'll take it." And the Spartans, despite having only one senior, look solid through the lineup. Seven players hit safety at St. Helens, and Hillsboro wound up with 13 hits and nine RBIs. "We're young, but we play really well together, and we've been hitting the ball really well," Staub said. "We're having fun," Harsin said. "It's coming together. We're seeing the ball and hitting the ball. It's a team effort. They're really buying into that aspect of it. We just want to keep it rolling, keep the kids confident, keep the kids loose." Staub went on to pitch a no-hitter in a 5-0 win over Putnam Thursday, April 11, striking out 15 Kingsmen in the process.